Start Autism Awareness Month on a sweet note with this gum ball alphabet matching activity! 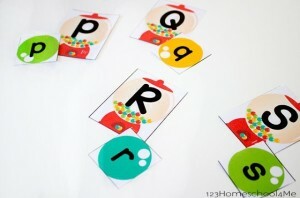 This free, easy-prep printable from lifeovercs.com and 123 Homeschool 4 Me helps young learners build strong letter recognition skills by asking them to match lowercase letter gumballs with uppercase letter gumball machines. All you have to do is print, cut and play! Flip all the cards over for an instant memory letter matching game! To make sure that your letters last, we recommend printing the activity on cardstock or laminating the letters for longer use. You can download this free printable here, but don’t forget to let us know in what other ways you and your students utilized this alphabet activity in the comments section! With five games in one, the options for practicing letter names and sounds, along with memory skills and story-telling are endless in the Grandma’s Trunk Alphabet Game. 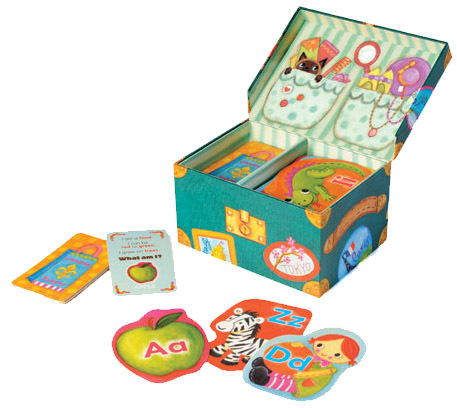 This set of 26 illustrated alphabet picture cards, 26 riddle cards, and guide all packed in one trunk allows you and your student to work on auditory memory skills and listening comprehension while playing What Comes Next?, Memory, Letter Sequence Memory, Grandma’s Adventures, or Riddles. 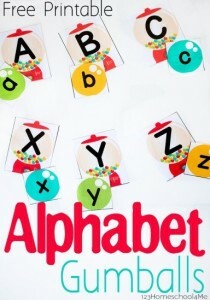 Each game involves the child pulling an alphabet card and then using a visual prompt to reach a goal, whether it’s sorting, recalling, creating a story, or solving a riddle. This week only, take 15%* off your purchase of the Grandma’s Trunk Alphabet Game by using our promo code TRUNK3 at checkout! What Comes Next? Take turns placing the letter cards in the trunk in alphabetical order. Memory Take turns repeating the sequence of cards already in the trunk, then adding one of your own and challenging other players to remember them all, in order. Letter Sequence Memory Deal the cards and take turns putting them in the trunk in alphabetical order, repeating the items already in the trunk and challenging other players to remember them all, in alphabetical order. Grandma’s Riddles Deal the cards and then read a riddle and race to see who has the letter card that answers it. *Offer is valid through Feb. 18th, 2014 at 11:59pm EST. Not compatible with any other offer. Be sure there are no spaces or dashes in the code at checkout!